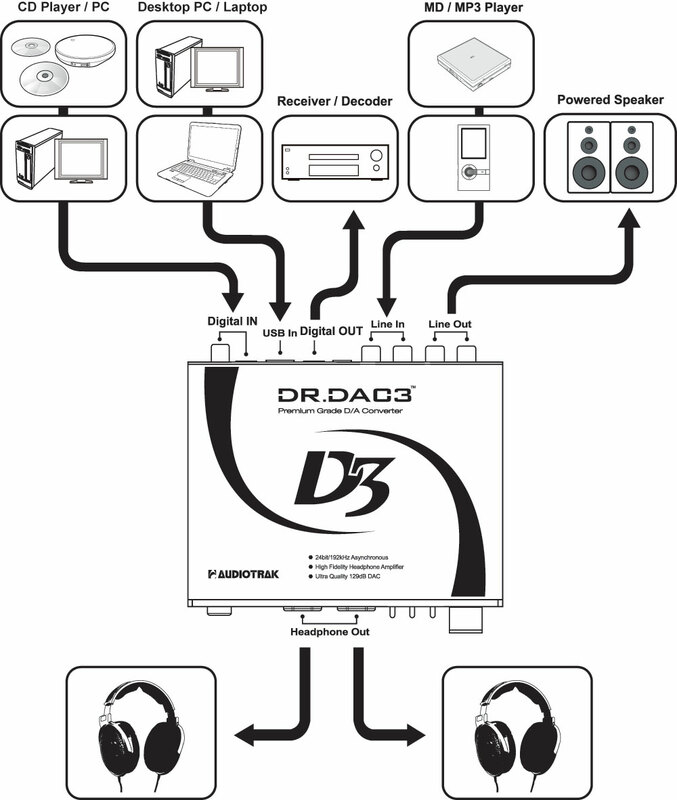 DR.DAC3, which is a technically perfect integration of the top level DAC and powerful dual headphone amps as well as having USB audio features that can build a computer based HiFi audio system, provides the most advanced digital audio solutions. 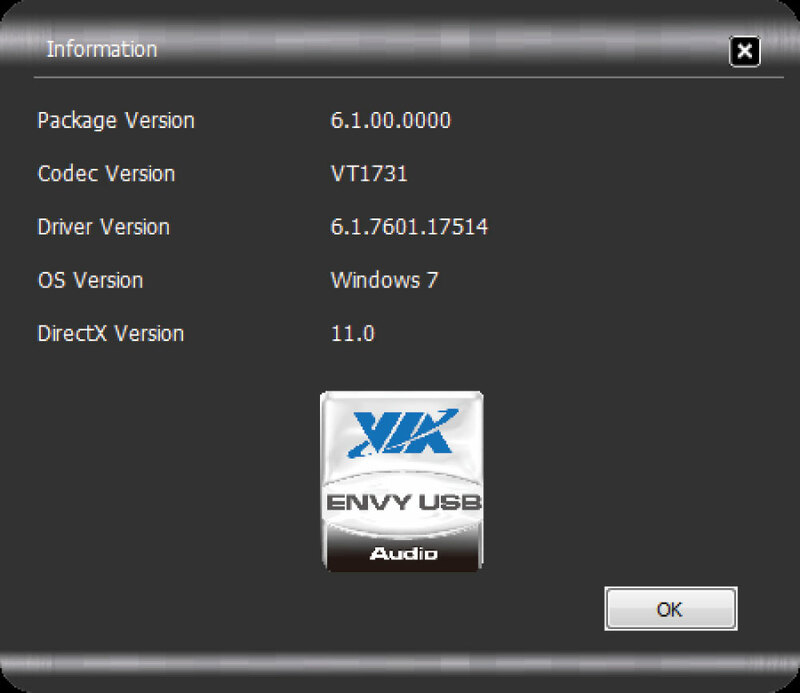 It adopts the highest VT1731 Envy USB Audio Controller by VIA Technologies, Inc., which supports USB 2.0 Hi-Speed (480 Mbps, asynchronous), to support 24bit / 192㎑ in Optical/Coaxial Input as well as USB Input mode and also adopts PCM1794, TI’s highest DAC with a dynamic range reaching to 129 ㏈ to hear high-quality sound source with rich resolution and HiFi sound quality. By connecting digital outputs of a source device that supports digital outputs such as CDP and DAT, and a computer’s sound card to the DR.DAC3, it provides high quality analog sound quality of a HiFi audio through TI’s highest DAC PCM1794 and triple OPAMP circuits of FDO (Full Differential Output) method. It supports Optical/Coaxial Standard S/PDIF Input (44.1㎑, 48㎑, 88.2㎑, 96㎑, 176.4㎑ and 192㎑) and USB Input (44.1㎑, 48㎑, 88.2㎑, 96㎑, 176.4㎑ and 192㎑), and can selectively use RCA Line-Out or dual Headphone Outputs. It is equipped with TI’s TPA6120A headphone amp exclusive chipset with powerful driving power and outstanding resolution to perform well qualified driving force for use of a 600 Ω studio monitoring headphone. When playing a high quality sound source by accessing the DR.DAC3 with CDPs and digital cables or by connecting any PC and USB, its output can reach the theoretical quality limit of the sound source that allows you to feel superior sound quality that you’ve never experienced. It has a high performance USB controller chipset that supports 24-bit / 192 ㎑ (asynchronous) so can be used as a HiFi USB DAC by accessing USB ports of a desktop or laptop computer. Besides the ability to perfectly utilize high-performance DAC and high-performance headphone amps in the USB mode, you can also digitally output 5.1 channel by supporting Dolby Digital (AC3) / DTS PassThrough and can record lossless S/PDIF Inputs (Optical, PCM signals) and internally playing sound. power OFF with lowest adjusted volume. A switch for the device’s power ON/OFF and an LED to indicate the power states. Connect the adapter power and press the power switch ON, then the LED will flicker three times slowly; turn it OFF and it will flicker two times before the power shut off. If you connect the power supply of the adapter or cut and reconnect it while the power switch is already ON, it does not convert right into an action mode but goes into a stan㏈y mode flickering the LED, so you should turn off and then turn on again by pressing the switch and it will be a normal operation status. It supports 2 headphone ports, which output the same signal with different output gains (OUTPUT No. 1: 10 Vpp; OUTPUT No. 2: 20 Vpp) that makes a driving force difference. You may connect according to the type of headphone that you use: for use of 16~32Ω earphones or 300Ω reaching headphones, connect to No. 1 Headphone Outputs port; for use of 300~600Ω studio monitoring high-impedance headphones, connect to No. 2 Headphone Outputs port. ※ If you want to use two headphones at the same time, you should connect them with the same type of impedance as the same output gains (20Vpp) are applied to No. 1 port as well as to No. 2 when you connect a headphone to No. 2 Headphone Outputs port. An LED that displays the device’s action state. The LED lights on while playing, and stays off for other times. It supports sample rate of 44.1㎑, 48.0㎑, 88.2㎑, 96.0㎑, 176.4㎑ and 192.0㎑. Applicable sample rate’s LED lights on when normal S/PDIF signal is found out from Optical/Coaxial Input or USB Input. If the sample rate goes beyond the range of ±3 % or it is not normal PCM signal, UNLOCK LED lights on and it may not operate normally. A switch that selects Digital Input Modes. It supports three optional modes and Coaxial, Optical, or USB can be selected according to the input signal. A selector switch for Digital or Analog Input. 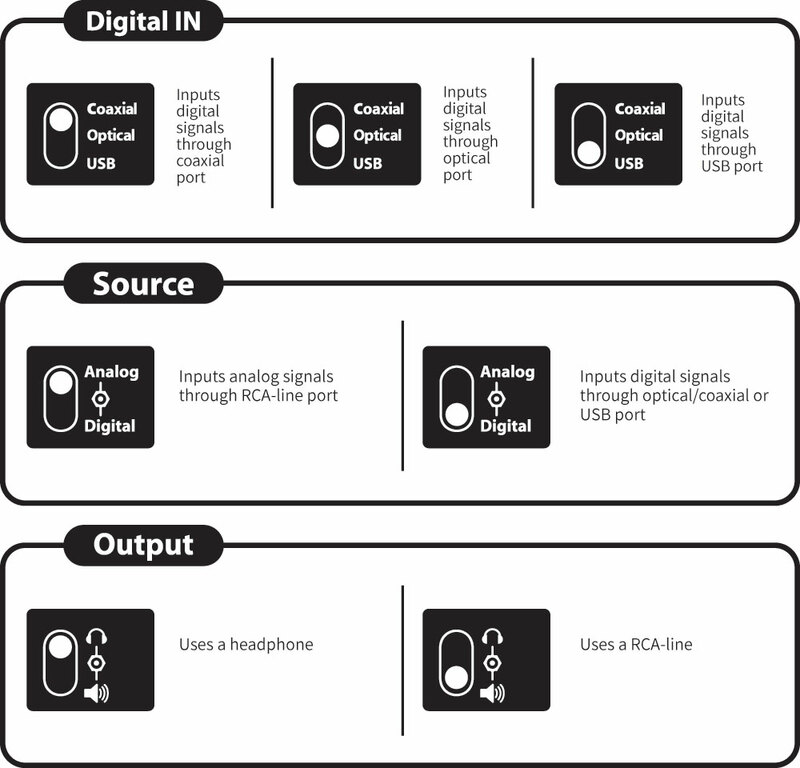 Select Digital switch when S/PDIF signal is received to an Optical or Coaxial port or USB external sound devices are used; select Analog switch then the analog signal received to RCA Line-In port goes through a Pre-amp circuit to the Headphone port or the Line-Out port. ※ FDO Triple OPAMP circuits are applicable only when using Digital inputs (Optical, Coaxial or USB), and only the Line-Out Pre-amp and the Headphone Pre-amp are applicable for using Analog input. You may selectively use the RCA Line Output and the frontal Headphone Outputs. When you select switch the output goes to RCA Line-Out, and when you select switch the output turns to the frontal Headphone Outputs. ※ You cannot use the RCA Line Output and the Headphone Outputs at the same time; and adjust the switch appropriately after converting it with lowest volume knob as momentary large output can be generated for the switch conversion. It controls the output level of the RCA Line-Out and the Headphone. In Windows, you may use it only after installing the driver that is included in the installing CD or downloadable from website; in Mac OS X, you may use it without extra drivers. Digital output with stereo PCM method that supports Bit-Perfect is possible for using the product as a USB audio device; and AC3(Dolby Digital) / DTS PassThrough output is possible in Microsoft Windows operating systems. ※1 You must connect an amp or speakers with built-in amp. ※3 Digital Out (Optical) operates only in the USB mode, and AC3 (DolbyDigital) / DTS PassThrough outputs support only Windows systems / Mac OS X. ※4 You must connect the adapter’s power to operate DAC and analog circuits when a USB connected to a computer. ※5 Digital In signals support stereo PCM signals only. Does not support non-PCM formats such as AC3 (Dolby Digital) / DTS. You may connect and use HiFi integrated amps, power amps or PC speakers with built-in amp to the RCA Line-Out port. You may connect analog source devices to the RCA Line-In port. You can connect various kinds of source devices that support general analog outputs without digital outputs such as a portable CDP and a MP3 player. Please connect the power adapter that we provide. When you use it as a USB sound card, digital output (optical) functions, and AC3 (Dolby Digital) / DTS PassThrough output is possible as well as stereo PCM signals. ※ When a pass-through is in use, be sure to turn the power off the main body or reduce the volume knob to a minimum; however, set the master volume to 100% on the Mac OS X. 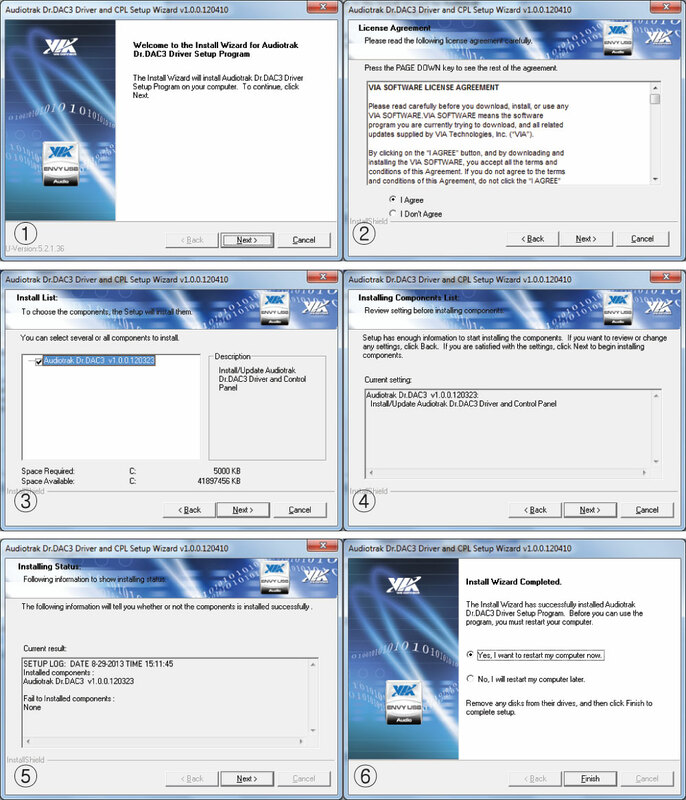 You may use it as an external USB sound card by connecting to a USB port of a desktop or laptop computer. You may connect it to several source devices (PC, DAT or CDP Digital Mixer) that support optical or coaxial typed digital outputs. Both optical and coaxial ones support 44.1 ㎑ ~ 192 ㎑ digital signal inputs (S/PDIF, PCM). 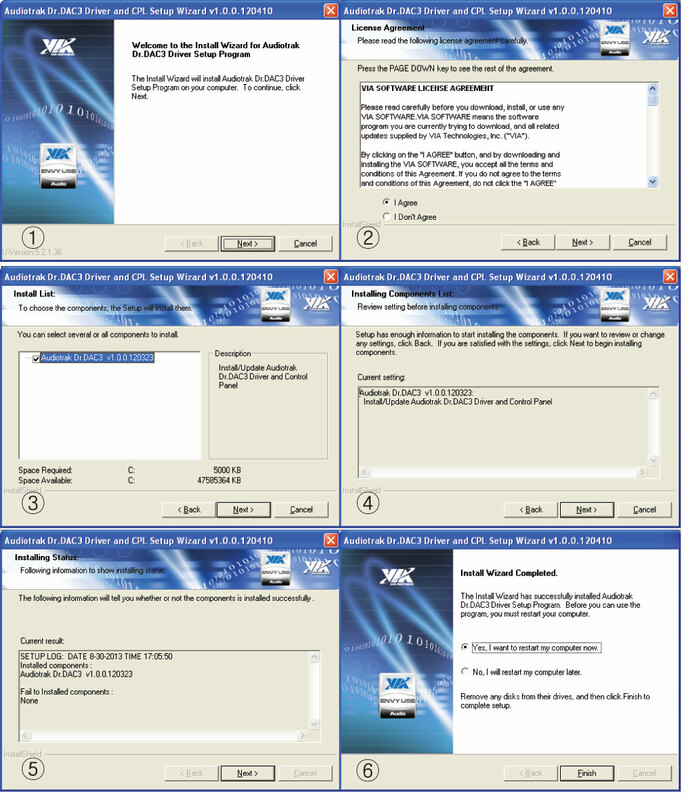 ※Essential point for driver install (For Windows XP/7/8)To use the function of the DR.DAC3 USB AUDIO, you must install a DR.DAC3 driver(VIA USB Audio Driver) through a provided CD or on the AUDIOTRAK's Web site (www.audiotrack.net). 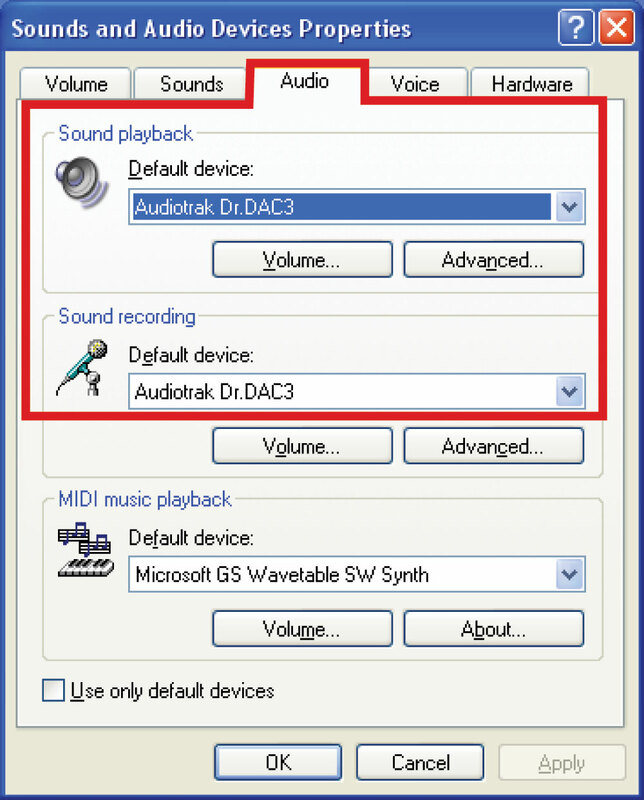 When the driver is installed and the Windows is restarted, the Audiotrak DR.DAC3 Deck will be displayed on the system tray of the task bar, where a click on the icon displays the following control panel on the desktop. ① Volume Control : to control the volume of the sound reproduced by the Windows and determine settings for the recording of sound. ① Selection of Playback on the Adjust Volume bar enables you to control the volume of each of the individual items. ③ The release of the volume interlock between left and right channels provides control of each of the outputs separately. DR.DAC3 allows you to record USB playback sounds and PCM signals without any loss. 1. For recording of PCM signals, set the Input Select switch on the front of DR.DAC3 to Optical and select Audiotrak DR.DAC3 as the basic sound playback and recording devices at Control Panel -> Sound and Audio Devices -> Audio. 2. For recording of USB playback sounds, set the Input Select switch on the front of DR.DAC3 to the USB position and select Audiotrak DR.DAC3 as the basic playback and recording devices at Control Panel -> Sound and Audio Devices -> Audio. A click on Speaker Test enables you to test the outputs of the left and right channels. ※ For more Advanced Option / Information / Power, please refer to the Windows 7/8 set-up. 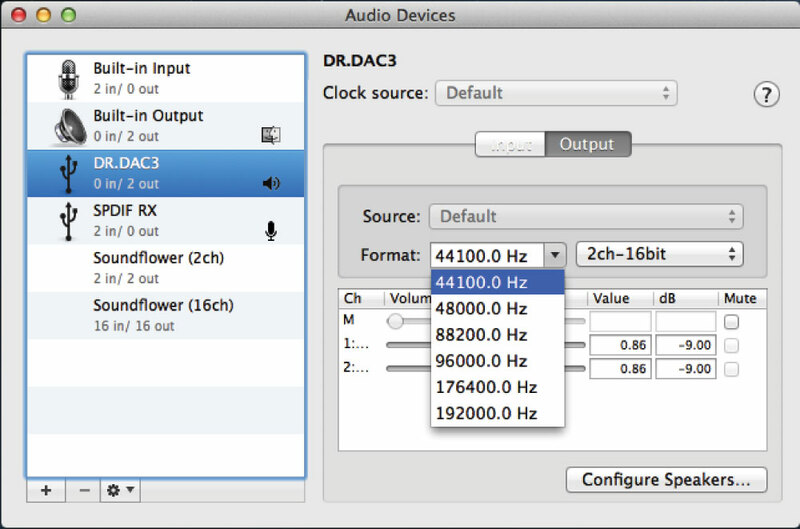 To use the function of the DR.DAC3 USB AUDIO, you must install a DR.DAC3 driver(VIA USB Audio Driver) through a provided CD or on the AUDIOTRAK's Web site (www.audiotrack.net). ① SPDIF Out : to activate all of the PCM, Speaker (Line Out), and Headphone outputs. ② Digital In : to enable recording when signals are input from an USB or a PCM device. ③ Master Volume : to adjust the overall volume of the output. ⑤ Set Default : to restore the default audio devices (for playback/ recording) on the Windows. 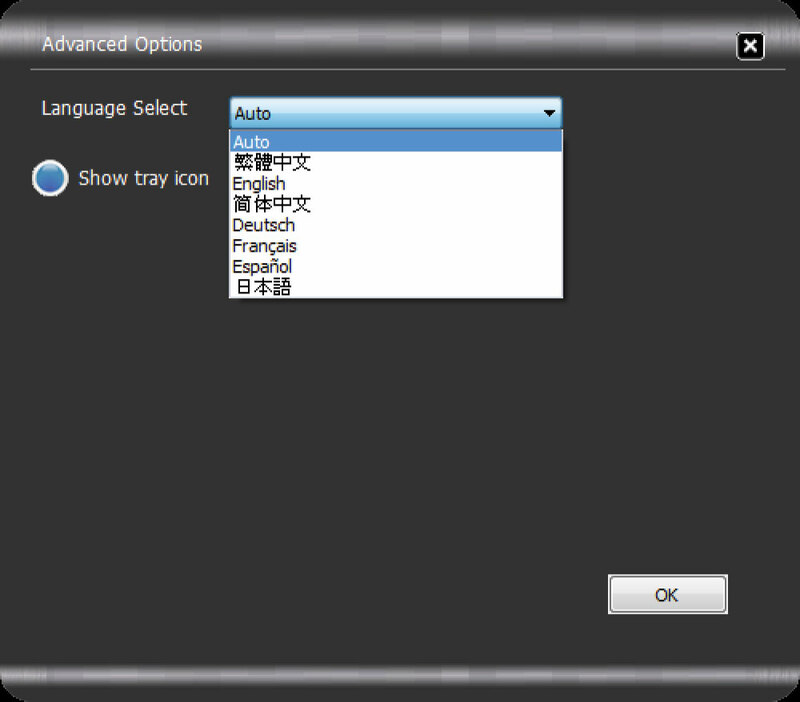 ⑦ Advanced Option : to select languages for the control panel and determine an icon displayed on the system tray. ⑧ Information : to check the versions of the driver, Windows, and Direct X. ⑨ Power : to end the control panel. ● When a PCM device/Speaker (Line out)/Headphone is used, ① Click on SPDIF Out ② Select Set Default to restore Windows’ basic audio devices, ③ Adjust moderately the output volume at Volume Control. ④ Move the Volume Control slider up and down, and it gets interlocked with Master Volume to achieve control of the output volume. ⑤ Release the interlock of the volumes between both channels, and separate control of the output volume will be enabled. ※ Be noted that the settings of items on SPDIF Out such as Volume Control and QSound NanoQ Effects permit only USB Audio playbacks, but do not respond to PCM signals. ● Settings such as ⑥Output on Default Format menu, ⑦Sample Rate, and ⑧Bit Depth can be changed. ※ Be noted that Sample Rate and Bit Depth can’t be changed while the audio is running. ※ Make sure that only the Sample Rate 44.1㎑/48㎑ can be applied when QSound NanoQ Effects is being enabled. ● Activation of ⑩ QSound Enable on the ⑨ QSound NanoQ Effects menu enables diverse QSound functions. QXEnable : to create a virtual surround sound environment using two channels to enhance the perception of sound spatialziation. Headphones : to apply a QXEnable setting fit for a headphone. QSizzle Enable : to enable this setting to emphasize high-pitched sound by adjusting the level slider on the right side for its intensity. QRumble Enable : to enable this setting to emphasize low-pitched sound by adjusting the level slider on the right side for its intensity. EQ Enable : to use a 7-band equalizer. A press on the EQ Reset button on the right side initializes it. ※ As excessive equalization may break output sound, moderate settings are required. Activation of EQ Enable will disable QSizzle/ QRumble automatically. ④ Move the volume control sliders up and down to adjust recording volume. 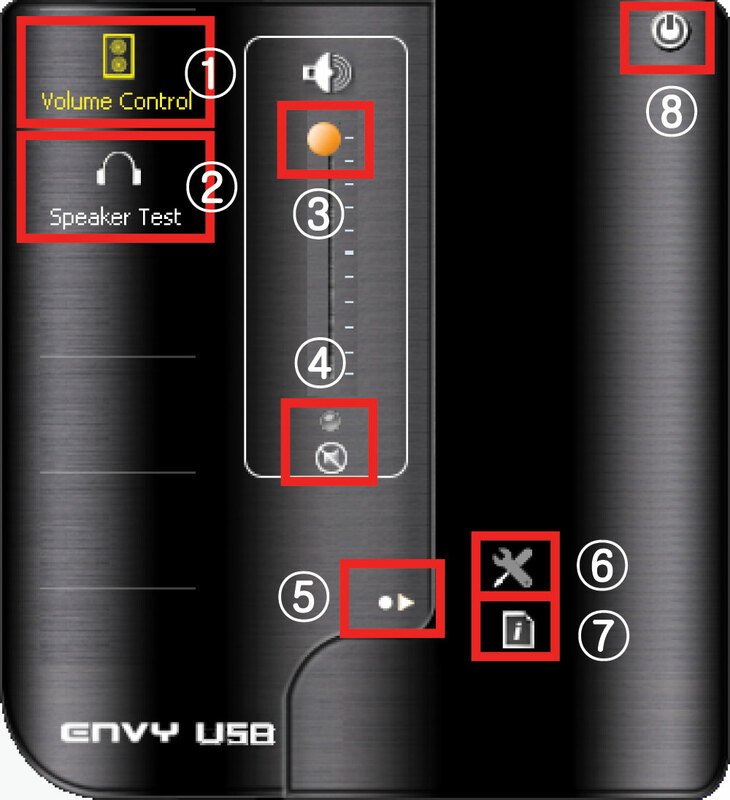 ⑤ Disable the volume interlock between both channels, and they can be adjusted separately. ⑧Bit Depth can also be changed. ※ Be noted that Sample Rate and Bit Depth can’t be changed while the audio device is running. Show tray icon : to display the control panel icon on the system tray of the window task bar. This window shows the versions of the driver, Windows, and Direct X. This icon exits the control panel. The control panel icon will continue to appear in the system tray of the Windows task bar when the ‘Advanced Option -> Show Tray Icon’ button is clicked. The program is automatically identified on Mac OS X and registered as DR.DAC3 on [Audio MIDI setting], in which Sample Rate and Bit Depth can be selected under the Audio Device window. Choose SPDIF RX among the audio input items under the Audio MIDI settings. Be sure to install the main board chipset patch driver before installing DR.DAC3. The display of an exclamation mark (!) at Control Panel -> System -> Device Manager indicates that the main board patch is not installed properly, in which case the installation of DR.DAC3 may develop an error. Make sure that the main board chipset driver be properly run prior to the installation of DR.DAC3. It is reco㎜ended to remove the program using the driver installation file, as an operating system cannot delete it through the Control Panel -> Add or Remove Programs co㎜and. A click on the VIA ASIO.exe icon after installation of the driver will display the following setup window. In order to use the ASIO output in a music player (e.g., Foobar 2000) supporting the ASIO interfaces, click on ‘OUT-(Audiotrak DR.DAC3)’ under ‘DirectKS Output Ports’ and press ‘Apply’ to execute the setting. In order to use a recording tool (e.g., Cakewalk SONAR) supporting the ASIO interfaces to record signals from a USB or PCM device, check on Digital Audio Interface- (Audiotrak DR.DAC3) under DirectKS Iutput Ports and press Apply to execute the setting. 1. Give ‘Set ASIO Buffer Size’ a moderate value (Reco㎜end to be within a range of 256 ~ 512 Samples) and select for ‘Output Formant’ the same value as that of the sound source to be reproduced. 2. Avoid checking on any unused items as they may cause instability in the system. 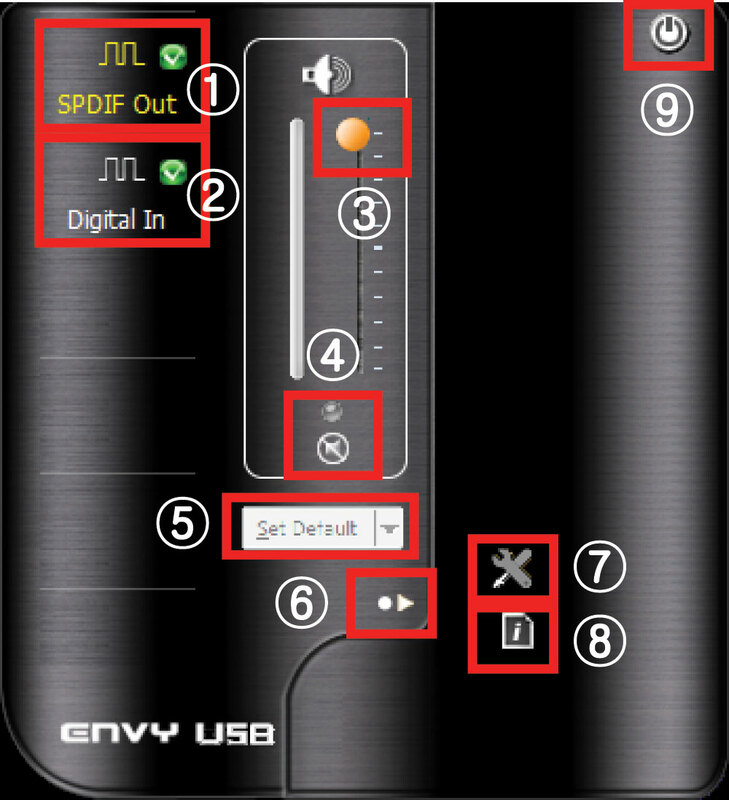 Especially, ‘DirectKS Input Ports’ is reco㎜ended to be left untouched when there is no need for ASIO inputs (recording), as reproduction of sound using a USB may develop problems. You may exchange OPAMPs according to your preference for music as the DR.DAC3 has 4 exchangeable socket-type OPAMPs. You must disconnect the power adapter in the backside of the DR.DAC3 and a USB cable before exchanging OPAMPs. 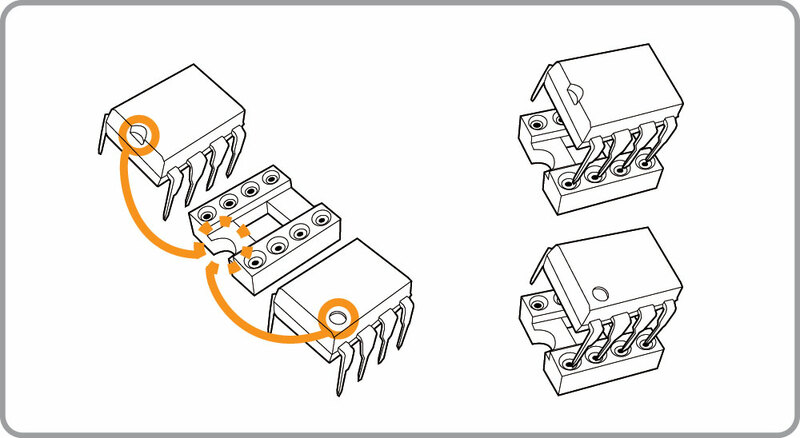 When you install OPAMPs, insert the OPAMP into the socket’s groove correctly with the same directions. Applicable OPAMP to the DR.DAC3 is a stereo (dual type) / DIP type, which you may use operable OPAMP in more than ±12V with its driving voltage. You may use SMD type OPAMP by converting from SMD → DIP; and you may use Single Type OPAMP by converting from Single → Dual.